Just like its inland scenery (which includes the wild heather moors of Bronte Country and the lush limestone scenery and windswept fells of the Yorkshire Dales), the region of England which is known as Yorkshire has a coastline which is frequently spectacular, varied, and interesting. From south of the mouth of the Tees and where the Cleveland Hills and the North York Moors meet the sea the coastline is rocky and wild, with numerous fishing villages and resorts including Staithes, Whitby and Robin Hood's Bay. Further south are the popular seaside resorts of Scarborough and Filey (positioned at the head of a broad bay which sweeps from the rocky prominentry of Filey Brig to the spectacular seabird colony of Bempton Cliffs on Flamborough Head). 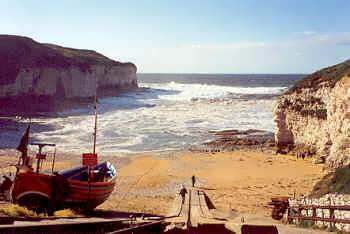 To the south of Flamborough Head is the resort of Bridlington - beyond which the cliffs give way to the much flatter Holderness coastline, and the smaller resorts of Hornsea and Skipsea. Inland from here are the hills and valleys of the Yorkshire Wolds (which sweep in a broad arc to meet the sea at the chalk cliffs of Flamborough Head). At the southern end of the Yorkshire Coast is Spurn Head, a constantly evolving peninsular of sand dunes and sand banks at the mouth of the Humber Estuary, and the famous sea ports of Kingston Upon Hull (better known as simply "Hull") and Goole. 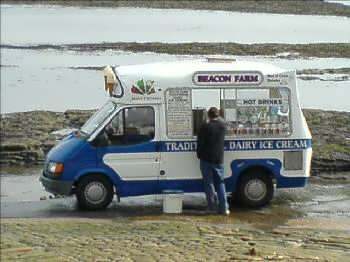 Please click here for links to other Yorkshire Coast related websites.